Porcini mushrooms are near legendary for their rich yet earthy umami flavour. In this dish they form an indulgent jus, perfect for drizzling over a seared sirloin steak. 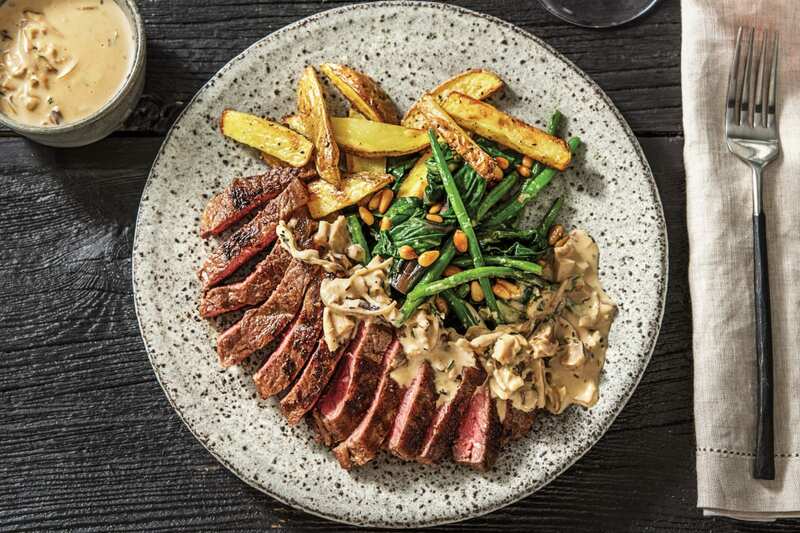 Along with potato fries and crunchy pine nuts, this meal with flavours of the forest is the perfect night in to celebrate. Preheat the oven to 220°C/200°C fan-forced. Place the dried porcini mushrooms and the hot water in a jug and set aside to soak for 20 minutes. Slice the potato (unpeeled) into 1cm fries. 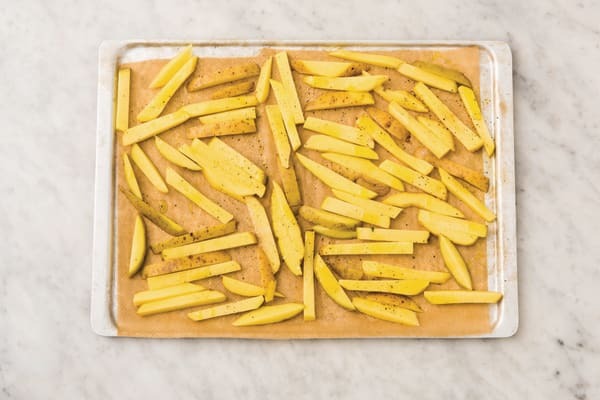 Place the potato on an oven tray lined with baking paper, drizzle with olive oil and season with salt and pepper. Toss to coat, then arrange in a single layer. Bake until tender, 25-30 minutes. While the fries are roasting, trim the green beans. Roughly chop the silverbeet. Thinly slice the eschalot. 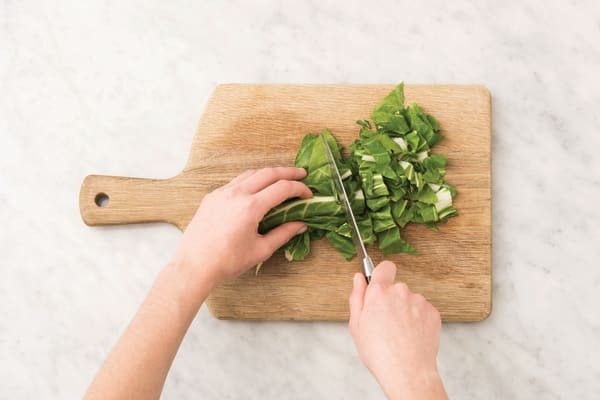 Finely chop the garlic (or use a garlic press). Pick the thyme leaves. Heat a large frying pan over a medium-high heat. Add the pine nuts and toast, tossing, until golden, 3-4 minutes. Transfer to a medium bowl. Return the pan to a medium-high heat with a drizzle of olive oil. Add the green beans and cook until softened, 2 minutes. Add the silverbeet and 1/2 the garlic and cook until wilted, 1-2 minutes. Transfer to the bowl with the pine nuts. Return the frying pan to a high heat. Drizzle the sirloin steaks with olive oil and season both sides with salt and pepper. 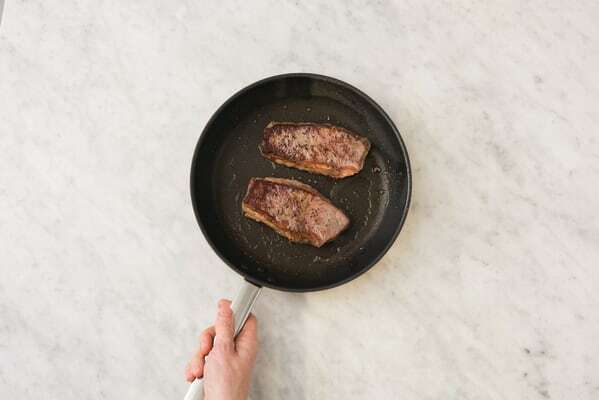 Once hot, add the steaks to the pan and cook for 2 minutes on each side for medium-rare, or until cooked to your liking. Using tongs, sear the fat until golden, 30 seconds. Transfer to a plate and set aside to rest. Rinse and finely chop the porcini mushrooms (reserve the soaking liquid!). 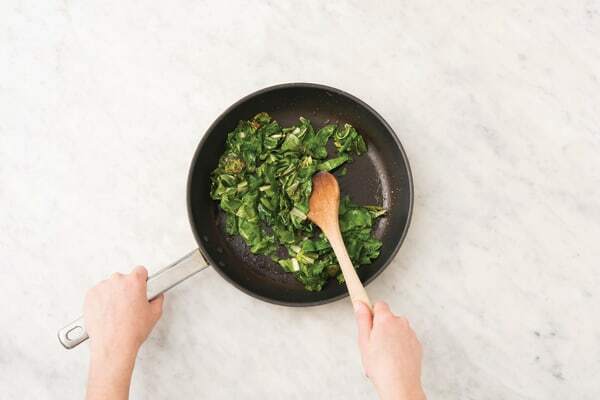 Return the pan to a medium heat with a drizzle of olive oil. Add the porcini mushrooms, eschalot and thyme and cook until softened, 1-2 minutes. Add the remaining garlic and cook until fragrant, 1 minute. Add the cooking cream, reserved porcini liquid (1/2 cup for 2 people / 1 cup for 4 people) and crumbled beef stock (1/2 cube for 2 people / 1 cube for 4 people). Simmer until thickened, 4-5 minutes. Season to taste with salt and pepper. TIP: Add the steak resting juices for extra flavour! Thinly slice the steak. Season the veggies and pine nuts with salt and pepper and toss to combine. 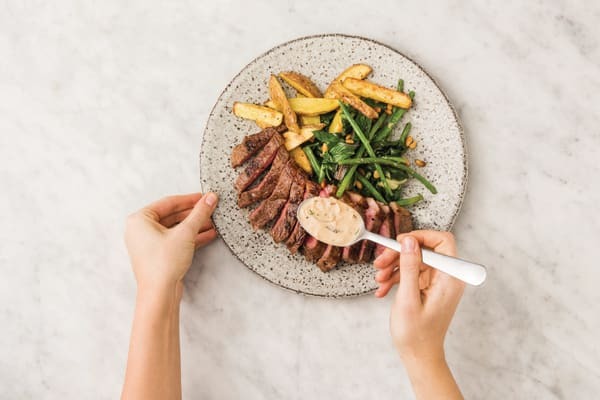 Divide the veggies, golden fries and sliced steak between plates. 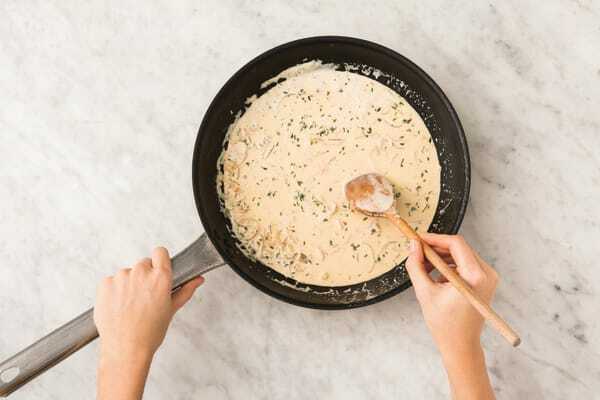 Spoon the creamy porcini mushroom sauce over the steak.